Tarzan is the son of a British Lord and Lady who were marooned on the West coast of Africa by mutineers. When Tarzan was a year old, his mother died of natural causes, and his father was killed by Kerchak, leader of the ape tribe into which Tarzan was adopted. Kerchak's tribe of apes is known as the Mangani, Great Apes of a species unknown to science. Kala is his ape mother. Tarzan (White-skin) is his ape name; his English name is John Clayton III, Lord Greystoke (the formal title is Viscount Greystoke according to Burroughs in Tarzan, Lord of the Jungle; Earl of Greystoke in later, non-canonical sources, notably the 1984 movie Greystoke). As a young adult, he meets a young American woman, Jane Porter, who along with her father and others of their party is marooned at exactly the same spot on the African coast where Tarzan's parents were twenty years earlier. When she returns to America, he leaves the jungle in search of her, his one true love. 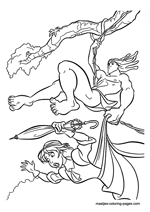 In later books, Tarzan and Jane marry and he lives with her for a time in England. They have one son, Jack, who takes the ape name Korak ("the Killer"). Tarzan is contemptuous of the hypocrisy of civilization, and he and Jane return to Africa, making their home on an extensive estate that becomes a base for Tarzan's later adventures. In the late 1880s off the coast of Africa, a young couple and their infant son escape a burning ship, ending up on land near uncharted rainforests (presumably West Africa). The couple craft themselves a treehouse from their ship's wreckage. The Man and Woman (Tarzan's biological parents Earl & Lady Greystone) are killed by a savage female leopard named Sabor. 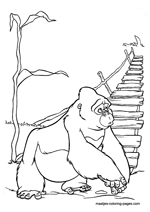 Kala (Glenn Close), a gorilla who recently lost her own child to Sabor, hears the cries of the orphaned infant, and finds him in the ruined treehouse. 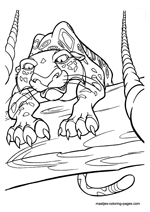 Kala is attacked by Sabor, who wants to kill and eat the baby, but Kala manages to get Sabor tangled in the ropes holding the derelict rowboat, and she and the baby escape. The kindly Kala takes the baby back to the Gorilla troop to raise as her own, despite her mate Kerchak's (Lance Henriksen) disapproval. Kala raises the human child, naming him Tarzan (Alex D. Linz as a young boy, Tony Goldwyn as a young adult). 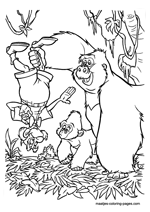 Though he befriends other gorillas in the troop and other animals, including the young female gorilla Terk (Rosie O'Donnell) and the male elephant Tantor (Wayne Knight), Tarzan finds himself unable to keep up with them, and takes great efforts to improve himself, including occasionally fashioning crude tools, to put him on par with the other gorillas. As a young man, Tarzan is able to kill Sabor with his crude spear and protect the troop, earning Kerchak's reluctant respect. The gorilla troop's peaceful life is interrupted by the arrival of a team of human explorers from England, including Professor Porter (Nigel Hawthorne), his daughter Jane (Minnie Driver) and their hunter-guide Clayton (Brian Blessed). Jane is accidentally separated from the group and chased by a pack of baboons. Tarzan saves her from the baboons, and recognizes that she is the same as he is, a human. Jane leads Tarzan back to the explorer's camp, where both Porter and Clayton take great interest in him�the former in terms of scientific progress while the latter hoping to have Tarzan lead him to the gorillas so that he can capture them and return with them to England. 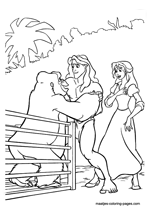 Despite Kerchak's warnings to be wary of the humans, Tarzan continues to return to the camp and be taught by Porter and Jane to speak English and learn of the human world, and both he and Jane begin to fall for each other. However, Clayton cannot convince Tarzan to lead him to the gorillas, due to Tarzan's fear for their safety from the threat of Kerchak. When the explorers' boat returns to pick them up, Clayton makes Tarzan believe that if he shows the group the gorillas, then Jane will stay with him forever. 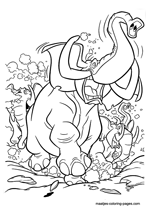 Tarzan agrees and leads the party to the gorilla troop's home, while Terk and Tantor lure Kerchak away to avoid having him attack the humans. 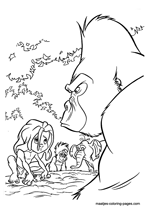 Porter and Jane are excited to mingle with the gorillas, but Kerchak returns and threatens to kill them. Tarzan is forced to hold Kerchak at bay while the humans escape, and then leaves the troop himself, now alienated by his actions. 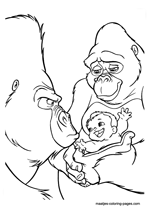 Kala takes Tarzan back to the treehouse she found him in, and shows him his true past (including an old photograph of Tarzan's biological parents, and himself as a baby). Kala encourages him to follow his heart, and leave with Jane and Professor Porter (although it will break her heart to see him go). When they return to the ship, they are ambushed by pirates, led by Clayton, who desires to capture and sell the gorillas in England for a fine price. He orders them locked below with the Captain and his crew, but Tarzan manages to escape with the help of Tantor and Terk, and races back to the gorilla home. 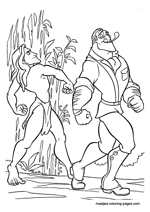 Kerchak and Tarzan together battle Clayton; Kerchak is fatally shot, while Clayton chases Tarzan into the vine-covered trees, where Tarzan gets the drop on him, destroying Clayton's gun. Clayton, in his haste to kill Tarzan, ignores his warning about the vine wrapped around his neck, and Clayton's neck is broken in the drop when he cuts himself free. 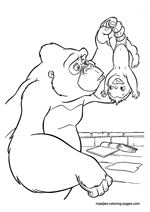 Kerchak, in his dying breath, accepts Tarzan as his own son finally, and names him the leader of the gorilla troop. The rest of the gorillas (including Kala) are freed by Jane, Professor Porter, Terk and Tantor, and other of Tarzan's miscellaneous animal friends (baboons, rhinos, etc. ), after fighting and/or scaring away the rest of Clayton's men, imprisoning them in the very same cages they planned to imprison the gorillas in. 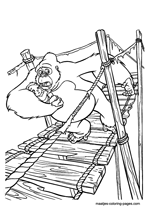 The next day, as Porter and Jane prepare to leave on the ship, Tarzan reveals that he now plans to stay with the gorilla troop. As the ship leaves shore, Porter encourages his daughter to stay with the man she loves, and Jane jumps overboard to return to shore; Porter shortly follows himself. 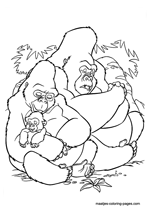 The two are accepted into the gorilla troop where, as the song says, they are all finally "Two Worlds, One Family".